Some of our friends invited us to a easter lunch at a church. We thought it would be a great idea to get a good easter bunny picture with Sebastian. 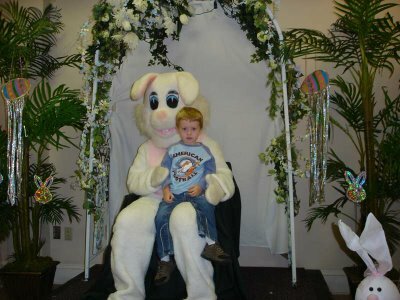 At first when we entered the church dining room and Sebastian saw the bunny sitting at one end of the dining room, he wasn't too keen on getting anywhere close to the bunny. At first we sat down and talked with our friends, so Sebastian could get used to the sight of the HUGE bunny at the other end of the room. We noticed that, when kids sat on the bunny's lap, they received an easter egg with some candy inside. We kinda blackmailed Sebastian to sit on the bunnys lap in exchange for the egg's with candy..